Ammunition transported by military truck out of Awae, April 4, 2018. Cameroon is cracking down on weapons proliferation as it battles two insurgencies and prepares to hold important nationwide elections this year. The military says it discovered a large cache of illegal weapons in a warehouse in Awae, near the capital. Cameroon’s military raided the warehouse April 30 after locals reported suspicious movements to and from it. Adjutant Chef Major Patrice Bella is a military official who led the operation. He says five gunmen working with the arm dealers fought back but were overpowered by the military. He says they will be investigating to find out the true owners of the weapons cache and what the weapons were to be used for. Inside the warehouse, soldiers discovered 10,500 rounds of ammunition, as well as an undisclosed number of explosives, guns, cutlasses and knives. So far, all those arrested are Cameroonian nationals. The location of the warehouse has sparked concern. Awae is 55 kilometers from the capital. The town hosts an international school for security forces called EIFORCES that trains African militaries on peacekeeping techniques. Officials suspect the weapons came overland from neighboring countries, in particular Nigeria. However local residents wonder how they got past police and gendarme posts around Awae. The discovery remains a hot topic of local conversation. 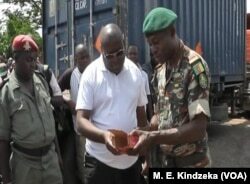 41-year-old road engineer Joseph Mbida says he is frightened because the discovery of ammunition and weapons amassed so close to Yaounde could mean people are planning to try to destabilize the country. He says he is counting on the military to track down those responsible. Cameroon heads to presidential, parliamentary and local council elections starting in October. Meanwhile the country is grappling with instability in the Far North, where troops continue to battle Boko Haram, and in the two English-speaking regions, the northwest and the southwest, where separatist rebels are demanding independence. In April, the government banned even the legal sale of weapons to civilians. Paul Atanga Nji, minister of territorial administration, addressing a security meeting in Yaounde, said there are as many as 30,000 war weapons and small arms in circulation in Cameroon. He says the use of weapons is reaching alarming proportions in Cameroon, threatening the security of everyone. He says some criminals even rent weapons to kill, steal and create disorder and that armed gangs are now found in all major cities and towns. He says the government must control its borders and stop the sale of arms. In Cameroon, a 2016 law made the unlawful possession of a firearm punishable by a prison term of five to ten days and a fine. However, the use of illegal firearms and weapons is judged by a military tribunal, with a possibility of life in prison if the tribunal decides the offender meant to disturb public order and peace.